Gunslinger Amani al'Hiza fled her dead-end hometown on the back of a mythical horse with the mysterious foreigner Jin, seeking only her own freedom. Now she’s fighting to liberate the entire desert nation of Miraji from a bloodthirsty sultan who slew his own father to capture the throne. When Amani finds herself thrust into the epicenter of the regime—the Sultan’s palace—she’s determined to bring the tyrant down. Desperate to uncover the Sultan’s secrets by spying on his court, she tries to forget that Jin disappeared just as she was getting closest to him, and that she’s a prisoner of the enemy. 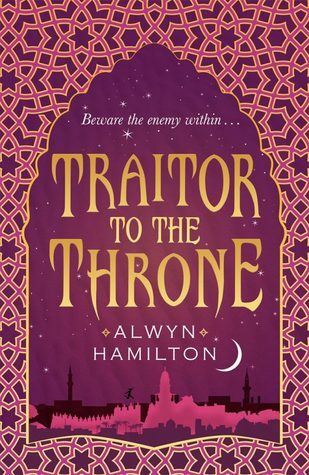 But the longer she remains, the more she questions whether the Sultan is really the villain she’s been told he is, and who’s the real traitor to her sun-bleached, magic-filled homeland. Forget everything you thought you knew about Miraji, about the rebellion, about Djinn and Jin and the Blue-Eyed Bandit. In Traitor to the Throne, the only certainty is that everything will change. Amani goes to the palace and meets the Sultan. She lives in the harem for a bit. Her cousin is executed for being with a Djinni. The Sultan builds a stone army using a Djinn’s life source and the traitorous Leyla’s machine. Amani and the others escape the palace but they’re found by the Sultan and his army pretty soon. “Ahmed” is captured. Amani and Jin try to save “Ahmed”, but fail. Imin as “Ahmed” is executed. Amani becomes the new rebel leader and they head off to free the captured rebels and find Rahim’s army. Amani breaks everyone out of prison using sand that she smuggled in. There’s a fight. Afterwards, she meets her aunt Safiyah, who was also imprisoned in the city. She takes her back to the rebel camp. The gang returns to the rebel camp and Ahmed is super mad. Amani and Shazad went to Saramotai without consulting Ahmed. Not technically going against his orders, but it was deception all the same. Jin returns from wherever he was before. Amani is annoyed with him for leaving without saying goodbye. Imin has her wedding and it’s kind of adorable until Ahmed and Jin start arguing and then they all get shot at. The rebel camp is under attack. Everyone splits off. Jin and Amani escape together and there are a couple of shippy moments. Safiyah knocks Amani out and puts her on a boat. Turns out she wants to sell Amani to the Sultan. Amani is taken to the palace. The Sultan asks Amani to lie (something a Demdjin can’t do) and tell him she’s not a Demdijn. If she does this, she can be set free, and Safiyah will be punished. Unfortunately, Amani can’t lie and Safiyah is rewarded. Amani is now imprisoned at the palace. Tamid from Dustwalk is also there. Gold and iron engraved with Amani’s real name is embedded under her skin, giving the Sultan full control of her. The Sultan orders Amani to summon a Djinn – her father, Bajadur. She does so. The Sultan threatens to kill Amani if Bajadur doesn’t co-operate, but Bajadur doesn’t seem to care and calls the Sultan’s bluff. Amani is put in the harem and told not to leave. Here she meets Leyla, one of the Sultan’s daughters. She also meets Kadir, his son and next in line to the throne. Kadir takes a liking to Amani, but thankfully the Sultan has said that she’s off limits. Amani comes across her cousin, Shira in the harem. She’s having Kadir’s baby, making her his first wife and the favourite, since she’s apparently giving him a son. Shira seems to know a way to get information in and out of the palace, so Amani asks for her help. Amani and Shira go to the wall that evening. Amani meets Sam, a man from another country who is pretending to be the Blue-Eyed Bandit. Amani corrects him, and asks him to take a message to Shazad (her bae). Sam is able to walk through walls, by the way. This is important information. Shazad gets Amani’s message, and comes to court. The rebels create a distraction in order to get Amani out, but Amani explains that she can’t leave as long as the metal is under her skin. Shazad has to leave her there. Cries. The Sultan shows Amani how to shoot a bow and arrow. He tells her to find him when she successfully shoots a duck. Amani manages it, and goes to find the Sultan. She barges in on an important meeting. She understands what one of the Gallan people is saying, and she detects that he is lying. She tells the Sultan this, and he keeps her around for the rest of the meeting. This helps keeps the rest of them honest. They eat the duck that Amani shot for dinner. The Sultan talks to Amani about his sons, and his motivations for keeping the kingdom safe. He talks about how he has had to make difficult decisions. He seems to respect Ahmed, but he doesn’t think his son is the kind of leader the country needs. Amani returns from dinner late at night. Sam is waiting for her in her room, dressed as a woman. He is making sure that she’s okay. Amani goes to Shira and requests her help. Shira pretends to go into labour to create a distraction. Amani sneaks into the palace to see her father. He tells her that there are ways to free him. He doesn’t know the words that would free him, but Amani could break the circle that is imprisoning him. Amani is caught by the Sultan and his soldiers. Rahim becomes Amani’s new personal guard. He tells her that he wants to help her and support the rebellion, but he wants his sister, Leyla, out of the harem and the palace first. Amani doesn’t trust him to begin with, but she then realises that he’s telling the truth. Rahim takes Amani to see Tamid. Tamid is missing a leg, which has been replaced with a metal one that Leyla designed. Leyla clearly has a massive crush on Tamid. Rahim leaves them alone so he can speak to Leyla. Tamid tells Amani that he hates her for leaving him in Dustwalk, but Amani doesn’t believe it’s true as Tamid hasn’t turned her in to the Sultan yet. Tamid asks Amani to leave. Amani waits for Rahim and gets attacked by the Gallan ambassador and Kadir. Luckily Rahim returns and saves her. He punches Kadir, kills the ambassador, and Amani pulls a gun on Kadir, although she can’t hurt him. The Sultan comes along and gathers everyone in his study. He tells Kadir off for wanting to hurt Amani. He tells Rahim off for killing the ambassador. He comes up with a cover story. After everyone else has left, Amani tells the Sultan not to negotiate and try for peace with the neighbouring countries. He asks her to leave. Shira goes into labour for real this time. Amani goes to find her, and SHOCKING TWIST, the baby is born with blue hair. Shira attempts to escape with the baby, but she is caught. She gives the Sultan the name of the baby’s father. The baby is taken away and Shira is imprisoned. The Sultan summons the baby’s father, Fereshteh, and asks him for the names of his fellow Djinn. He gives a tonne of them up. Fereshteh is the Djinni who wanted to kill the humans after the world fell into peaceful times again. The Djinni voted against him. Fereshteh gave the Sultan the names of those who voted against him. Hala and Imin, disguised as servants, take Fadi away from Amani. They tell Amani that they can’t save both her and Shira. Amani goes to visit Shira, who tells her that Fereshteh promised to make her the mother of a ruler. Shira is executed, but not before she stirs up the crowd with her speech. This causes the city to riot. Tamid agrees to remove the gold from Amani so she can escape, but he refuses to remove the iron. The Auranzeb party finally happens. Amani and Shazad see each other again <3 They meet the Bilal of Iliaz, and want to set up a meeting with him and Ahmed. Jin arrives at the party along with the Xichian prince. Sam gets Amani and Shazad out of the party during the Sultan’s speech. They go to the Djinn who have been captured. Leyla has created a machine that can kill Djinn. She kills Fereshteh. The statues in the palace come to life, which was part of the Sultan’s trap for the rebels. Amani and Jin try to save Tamid. They’re chased by Kadir, whose throat is then cut by the Sultan, who is trying to cause civil wars in the neighbouring countries. Amani and Jin escape and THEN THEY KISS AGAIN. NOT THE BEST TIME, GUYS. The gang goes to Shazad’s house. There’s a secret tunnel and garden where all the rebels are hiding. Ahmed hugs Amani and IT BECOMES MY SECOND OTP OF THE SERIES. The Sultan declares Miraji independent. He also declares that there will be a Sultim trial to find a replacement for Kadir. Leyla tells Ahmed that the Sultan threatened Rahim so she built the machines for him. Ahmed meets with Prince Bilal. He offers his services in return for a Demdji wife. Jin offers to marry Amani so she can’t be Bilal’s wife. Delila wants to marry Bilal to help the cause. Ahmed doesn’t know what to do, because Amani is offering to marry Bilal as well. Amani suggests they rescue Rahim, because Bilal’s army will follow him. They discover that they can destroy the stone army by destroying their iron power source. Amani disguises herself as her mother with the help of Hala and goes to Safiyah. Safiyah removes the iron from under Amani’s skin. It turns out that the Sultan had been feeding the rebels false information through Rahim and Amani. Leyla was involved. She put a tracker in Tamid’s leg and the Sultan followed the signal to the rebel camp. There’s a massive fight. Amani and Jin try to fly away on Izz, but Izz is shot and they crash to the ground. Jin and Amani are okay. Amani learns that Ahmed was captured and his execution has been planned. Amani and Jin go to rescue Ahmed. Amani arrives at the palace but she can’t save Ahmed before he is executed. Another OTP ruined. The rebels assemble at Shazad’s place. AND !!!! PLOT TWIST!!! The person who was executed at the palace was actually Imin in disguise as Ahmed. MY SECOND OTP LIVES. Except it’s also really sad because Imin gave her life for the cause. Amani becomes rebel leader (basically General Leia) and plans to rescue the captured rebels from the palace and then get the army from Iliaz.